The second trial design of the internal arrangement of the Cathedral begins next week. The next step in the restoration of the Cathedral is to trial a different internal arrangement of the pews and the location of the Sanctuary (Altar, Ambo, Presider’s Chair & Cathedra). Bishop Michael engaged Fr Tom Elich from Brisbane to design a layout that makes the best use of the space in the Cathedral. Fr Tom wrote that his design “is based on locating the ‘sweet spot’ (for the altar to be) visible from the nave and both transepts (former Blessed Sacrament Chapel and Keppel Street side)” and “to give the Cathedral a spacious feel”. Fr Tom’s design relocates the Altar and Ambo back towards the 1897 altar. The new design removes the pews from the outside of the pillars in the nave and from the lower ceiling area in the Keppel Street transept. These changes are shown on the plan. 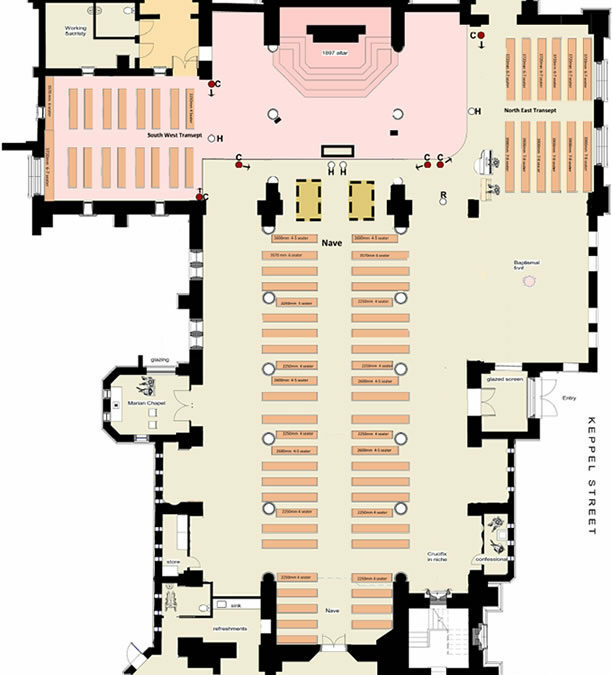 The location of the distribution points for Holy Communion will now be in front of the Altar, in front of the two banks of seats in the Keppel Street transept and in front of the pews in the former Blessed Sacrament Chapel. There will still be a communion minister moving about the Cathedral to distribute Holy Communion to those people less mobile than others. Towards the end of this second trial design, an evaluation of the merits of these arrangements will be conducted.